Styx on touring and surfing the "giant wave of joy"
For Styx, the start of 2013 means another year on the road. The rock band, which recently kicked off its latest U.S. leg, truly shows no signs of slowing down. 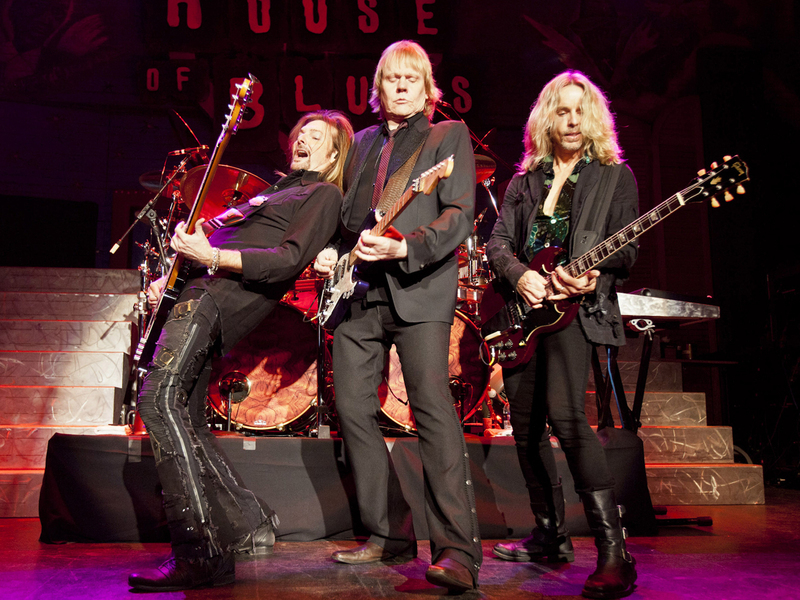 In recent years, Styx has found its home onstage, performing more than 100 concerts a year. "There's a straight joy that emanates from the stage. By the end of the 110 concerts we do every year, we and the whole crowd are surfing this giant wave of joy," said James "JY" Young, guitarist and founding Styx member. He's joined these days by singer/keyboardist Lawrence Gowan, guitarist Tommy Shaw, drummer Todd Sucherman and bassist Ricky Phillips, along with occasional appearances by original bassist Chuck Panozzo. "This is Styx 2.0 and it's a more rockin' version of the band," Young said. When asked why songs such as "Renegade" still resonate, Young hesitates to give an answer, saying, "You're standing in the middle of something, but you can never distance yourself far enough to really see, 'Well how did we do this?'" But then he managed to come up with an answer: "I guess why it would be because there's powerful human emotion that crosses generations that's expressed in our music. And we did it with electric guitars and electric keyboards and a big set of drums and a throbbing base line -- and that still works." While Styx relies on touring for income, hitting the road every year really comes down to the music, Young says. "Music is this incredible force that we are the stewards of. It comes from a higher place. It channels through us," he said. "And music has the power to calm, to soothe, to inspire -- and in the very best cases, to heal and motivate." Still, Young understands that if Styx were to put out a new single, it probably wouldn't become a hit, let alone get heard on radio today. "We recognize the fact that as artists we're expected to produce new music and Tommy is at the creative center of this carnation of Styx...But new music doesn't go anywhere," Young said. "I don't hear the new Stones, the new McCartney, the new Aerosmith on the air...the new REO...the new Heart." Which is why touring has taken on an even more important role. "We were the soundtrack to the baby boomers' glorious youth and they sort of keep showing up and there's a lot of people who bought our records but maybe never saw us live...For us, we have something in our live show that cannot be digitized -- you just cannot duplicate being in a concert venue," said Young, who still calls Chicago home. "I don't care how great your surround system is...There's just a magic that happens. There's a human energy and an excitement and a joy that enters a concert hall." Attending a Styx show today is a bit different that it would have been, say, 30 or 40 years ago. Singer Dennis DeYoung was on board then, but he hasn't played with Styx for years. Young says the last time they were considering working together was in 1999 when they had a chance to go on a major tour. "It was a 10-lane super highway of opportunity and he didn't feel well enough to go on the road," recalls Young. "When album sales are down, the only way a band has to really pay their mortgages is to get out there and perform live. We went on without him. I offered him to just do part of the deal and ultimately he didn't want to do that. He sued us in federal court over the use of the name years later. We settled a year after that. We have use of the name. He can't use it -- except to say he can play as Dennis DeYoung, performing the music of Styx. And he gets a piece of the action of whatever we do." Despite all of that, Young says he harbors no hard feelings. "Dennis is a really talented guy. I wish him well," he said. "We did some great work together. We really had a lot of trouble working together for the last 20 years and getting along. He and I have a lot in common, but we also have some glaring differences, which we've also had. He really showed an affinity for musical theater...We've always had a very different musical tastes. And there was a middle ground where we were able to compromise. But he loves staying home and writing." Would a Rock and Roll Hall of Fame induction, for example, bring them together? It's unclear, as Styx has yet to be inducted. "People think that we're already in the Rock and Roll Hall of Fame. There's really no classic rock bands to speak of that are the Journey, Foreigner, Styx genre that have been admitted....People seem to have a problem with it. I don't have a problem with it. We'll eventually get in there. At any rate, people already think we're in the Rock and Roll Hall of Fame," Young said laughing. "So, what does it really matter?" Meanwhile, as Styx begins another year of touring, Young says he doesn't foresee any reason to retire, citing jam-packed shows and a growing younger audience. "Honestly, I don't know why we would ever want to stop," he said.